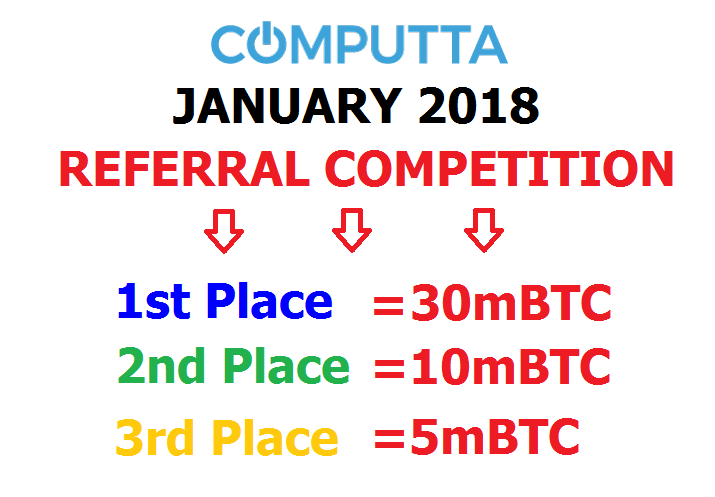 January 10, 2018 we start our new Referral Contest – Winner Gets 30mBTC (approx US$450!)! One Who Gets the Most Personal Referrals Wins! One who gets the most wins! Only legal and ethical promotion methods allowed. Your referrals must be real! Not some fake signups or paid-to-signup crap. We WILL be checking if your referrals actually download, install and run our app. If we catch you getting fake/bogus/paid referrals, we WILL delete your account and BAN you from Computta, with all current balance forfeited. No negotiations! Stick to The Rules, Play Fair! By popular request from our users, we will be posting TOP 20 affiliate list here on this post every weekend. So check back and see if you are in the Top 20 and how much you need to push to grab one of those Top 3 spots. So let’s roll and good luck! chinatube20*****.com 1410 referrals – First Place – second month in a row! sahil.sahiltheg*****.com 810 referrals – Second Place – out of nowhere and straight to top! simionatofrance*****.it 720 referrals – Third Place – again, very well done! adforce8*****.com 628 referrals – Fourth Place! nestmail0*****.es 572 referrals – Fifth Place! Congrats to all who are on this list! And to all who promoted but didn’t get on the list, keep pushing and you will see yourself here one day!